Welcome to Advent and to Day 1 of our 2014 Cocktail Advent Calendar. The themes of the carols in the first week of the calendar all revolve around the Christ Child. The first carol on our list is The Coventry Carol, sometimes known as Lully, Lullay Thou Little Tiny Child. It dates from around the 14th century and has regularly been performed in nativity plays in Coventry, England since at least the 1500's. In the plays, the carol is sung by three Bethlehem women who enter on stage immediately after Joseph has been warned by an angel to take his family to Egypt to avoid Herod's Slaughter of the Innocents. Kate loves this carol largely for the melody which incorporates a Picardy third (a crazy awesome mysterious chord) considered both the most musically and emotionally consonant chord (take that, flattened sixth chord!). 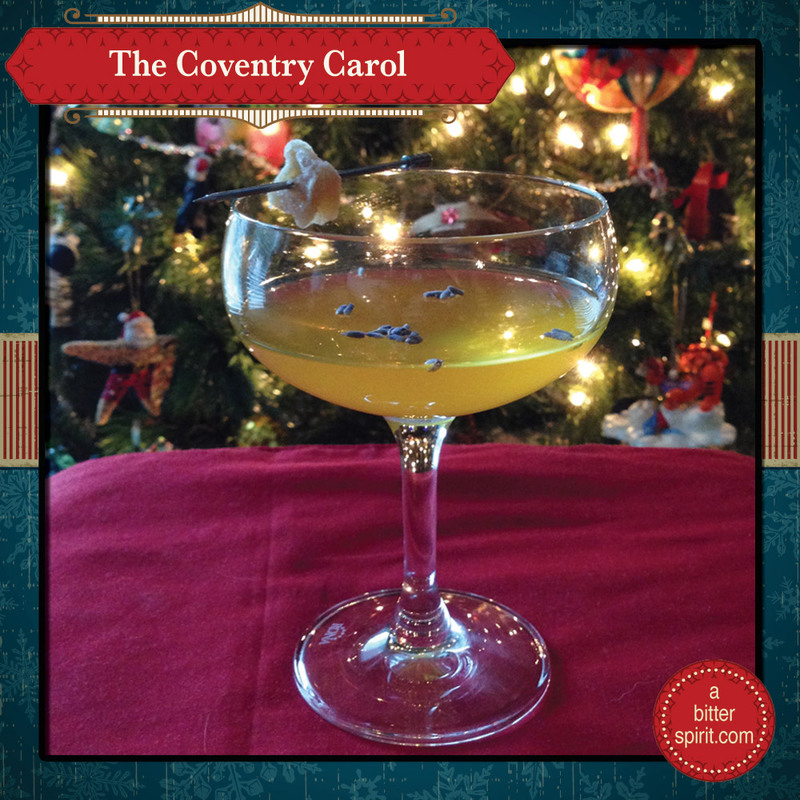 We wanted a drink that would match the mysterious and resonant sound of this carol as well as play to its heritage in Coventry. One of the biggest discussions we had was whether we could make a drink that was good both cold (like Kate wanted it) and hot (like Drew preferred). So we decided to start with a rum base and build from there. Combine ingredients in a cocktail shaker and shake over ice. Strain into a coupe glass. Garnish with a few lavender buds and a piece of candied ginger. To make the hot version, pour the mixture into a mug or other heat-tolerant glass. Add 2 ounces of boiling water. We were originally going to make this with Galliano instead of Suze, but the Galliano was sweeter than we wanted and without a bitter note. The Suze was perfect. The first version didn't have lemon juice, but it proved too sweet, so we added the lemon juice to freshen it up a bit. If you are not using fresh lemon juice in your cocktails (fresh lime juice, etc), you really need to start. Seriously. Why aren't you? We also did a version with only lavender syrup (in an effort to cut the sweet), but there is something magical about the lemongrass, so we ended up cutting the ratios down on each syrup by half but kept them both. It may seem a bit fussy to make two syrups, but seriously worth it. We tried a few different types of bitters, but none of them hit the right note as the Suze. They all substantially changed the nature of the drink and didn't really add the extra dimension we were looking for. It's pretty amazing .. you can make practically any kind of simple syrup. The lavender was lovely. Sneak peek: we're going to be doing a pink peppercorn syrup and a cardamom one as well.